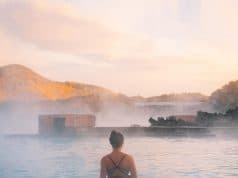 Have you ever dreamed about taking a hot bath in geothermal waters at -5 degrees Celsius, wearing nothing but your swim suit, surrounded by hardened lava fields and beautiful, stark scenery? You’re not the only one! 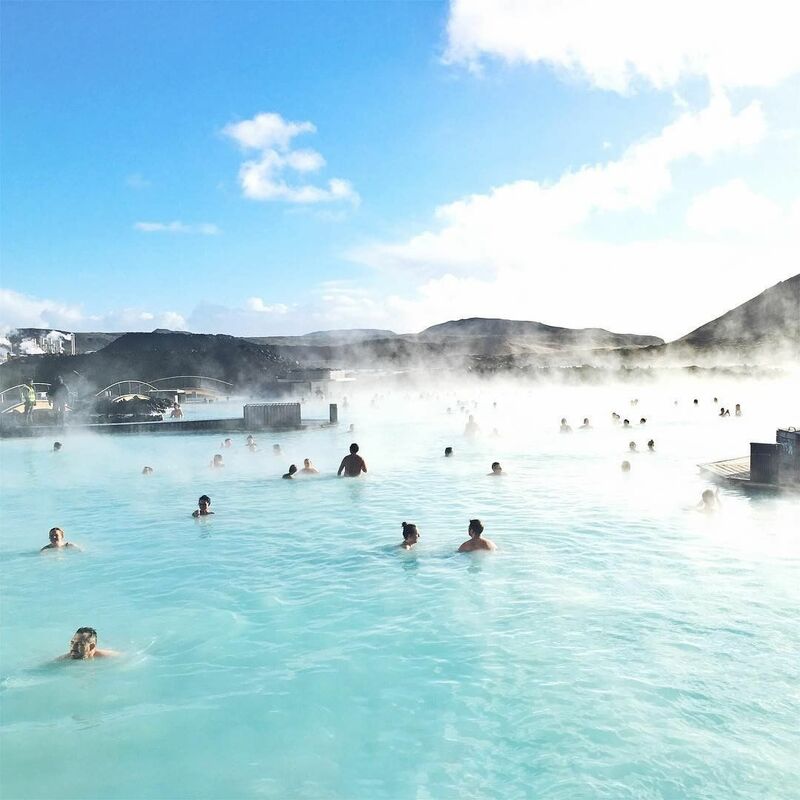 There are only a few locations that fit this to a T around the world (most of them located in Iceland), yet one of them stands tall in the crowd – Iceland’s beautiful Blue Lagoon. Whether you would prefer to visit it during the day, or enjoy the idea of splashing in the luminescent Blue Lagoon at night, chances are this concept will feel a bit weird at first. 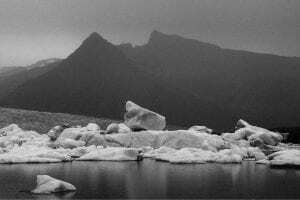 But this is what Iceland is about – everything is different from the norm. All images on this article are brought to you by the Blue Lagoon Instagram page. The Blue Lagoon is among the most tourist-covered attractions in Iceland. After visiting, it’s easy to understand why. The Blue Lagoon color makes it unique – a whitish nuance of baby blue that contrasts the surrounding black lava, covered in green moss. The dark surroundings make the water color even more attractive. If you’ve ever seen pictures of this place, you’ll most likely think they’re digitally modified – wrong! Believe it or not, some people visit this lagoon without even diving in – only for the stunning appearance. The Blue Lagoon is not an actual lagoon. In fact, it’s a lake. Despite Iceland’s low average temperatures, the water has the perfect temperature for a bath. It’s usually constant at 39 degrees Celsius, yet it can get a bit cooler or hotter at times. You can find the Blue Lagoon on the Reykjanes peninsula, in the southern part of the country. 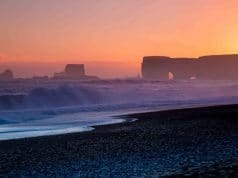 If you travel from abroad, you’ll only have to drive for 15 minutes from Keflavik International Airport to get there – or half an hour from Iceland’s capital Reykjavik. 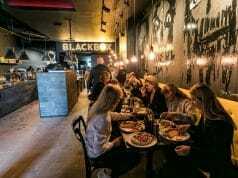 Given its proximity to the airport, it’s the perfect destination once you get to Iceland or right before leaving. 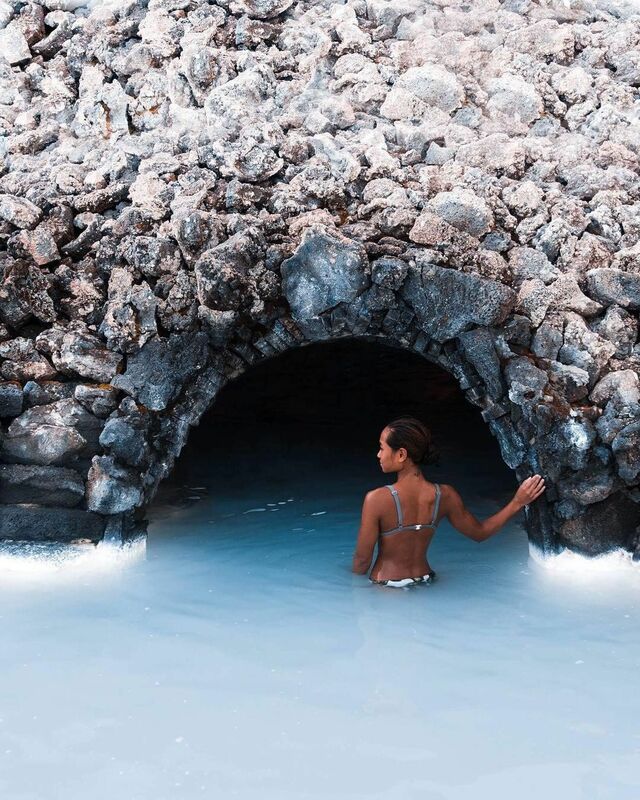 It’s no surprise why the Blue Lagoon has become Iceland’s most visited attraction. Not only the Blue Lagoon color is stunning, but the water is warm enough for a bath and comes with numerous benefits for your skin. Furthermore, celebrities from all over the world end up bathing there. Given its growing popularity, you’ll have to book days in advance or even weeks, especially if you choose to visit during the peak season in the summertime. Booking is easier if you plan to visit the Blue Lagoon at night, though. Categorized as a spa, the Blue Lagoon is open year round. Some people visit it during the day, while others go bathing at night. There is a standard entry for people over 14 years old, while kids between 2 and 13 can go in for free. Keep in mind that booking is required. There are currently three levels of package offered for visitors to the Blue Lagoon: Comfort, Premium, and Luxury. The Comfort Package covers entrance to the Blue Lagoon, a silica mud mask given by employees who wander about the lagoon pool, the use of a towel, and a free drink of choice from the bar. The Premium Package covers everything in the Comfort Package above, and additionally, an algae mask given by one of the employees in the pool, use of a bathrobe and slippers, optional reservations at the wonderful LAVA Restaurant onsite, and free sparkling wine when dining at LAVA. The Luxury Package covers everything in both the Comfort Package and Premium Package, but also includes entrance to the Exclusive Lounge, private changing rooms, and a complimentary Spa Journey product set. Opening hours at the Blue Lagoon depend on the time of the year. It’s open between 8 AM and 10 PM year round though, with extra hours in the summertime. Finding a spot might be hard when you book too late. However, it’s worth noting that early mornings are not too popular among tourists, so you should be able to book a slot even with short notice. There is a limit to the number of guests in the lagoon during the day, so even if you get a busy spot, you’ll still have plenty of space and privacy around you. There are plenty of facilities around. The Blue Lagoon is a natural spa, but it has developed into a professional fully featured facility over time. You’ll find specific spa rooms for sauna, steam treatments or silica mud masks, among many others. There’s also a cave to explore, as well as an artificial waterfall to rinse. If you feel like chilling after a long treatment, you can always head over to the relaxation room, which provides stunning views over the man made silica-enhanced lake. Looking for a drink? There’s a bar inside and you can grab all kinds of drinks, including alcoholic drinks. There is also a bar in the water, so you can grab a drink without having to expose yourself to the chilly Iceland air. You’ll be given a bracelet as you enter, which is connected to whatever credit card you gave upon arrival. In order to prevent incidents, the Blue Lagoon operators limit alcoholic beverages to three per person. Other than that, you can also opt for healthy smoothies and slushies. The warmer temperature and the sun are the main reasons why the lagoon is favorably visited during the day. This is when compared to the Blue Lagoon at night. Some travelers are aware of the so called tourist traps. They look good in pictures, but they’re overcrowded as soon as you get there. You can’t do anything and you have to wait for hours in queues. This place is different though, mostly because of the limitations to the number of guests. With all these, most tourists still choose to visit the Blue Lagoon at night. If you visit during the summertime, you can enjoy the sunlight at unusually late hours. 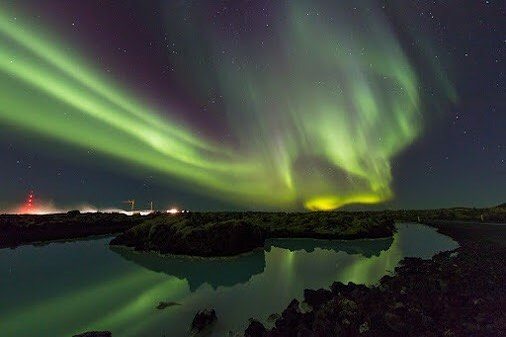 If you visit in the wintertime, you’ll love watching the Northern Lights while taking a bath (see the image above). Visiting it at night is far more relaxing – not too many kids around, not too many tourists (as a lot of them are either in the airport waiting on their flight to take off, or are back at their hotels, hostels, or campers) and certainly less noise. The sky is clear and allows you to see thousands of stars – a view that you can only admire in northern countries. Even if you can’t see the lights, there are still some special colors to admire. The lagoon looks like it’s lit on the bottom, yet it’s just its natural color. If you plan to visit the Blue Lagoon at night, you better book early. Most people would choose to see it at night. You’ll still have plenty of privacy though. There’s only one major disadvantage – your pictures cannot describe what your eyes can see. Lighting conditions are quite low, so you’re less likely to impress your friends. 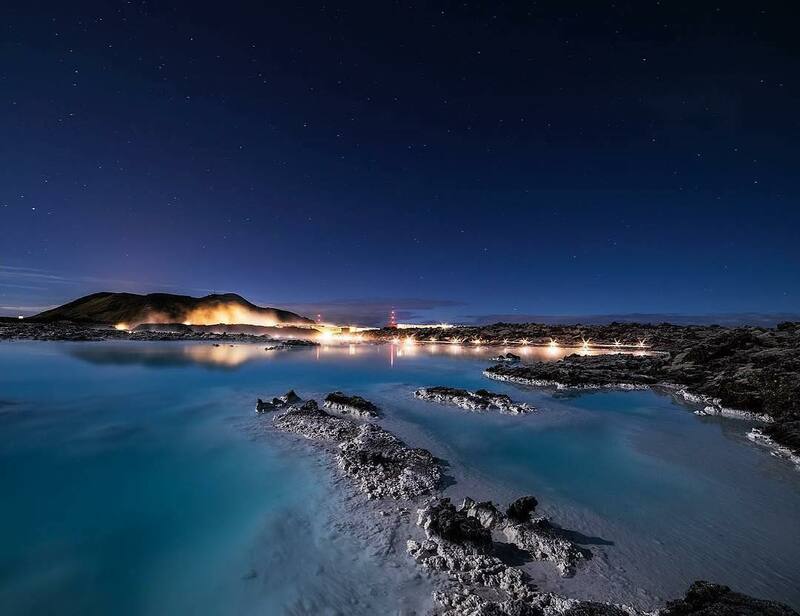 In the end, visiting the Blue Lagoon at night is certainly a plus for the overall experience. Apart from the benefits over your skin, you’ll love the clear sky… And fingers crossed for the Northern Lights! If you’re more into touristy things rather than the experience and you want to snap some awesome pictures, pay a visit during the day. Or even better… Go there before sunset and enjoy a bit of everything. There are no wrong ways to experience this beautiful place.